Lee Morgan was a brilliant trumpet starand was recognized for his talents by the time he was a teenager. By 1960, he had recorded with legendary jazz musicians like John Coltrane, Tina Brooks, Dizzy Gillespie, and Art Blakey. But the downside to a rising artist’s life is the drugs and alcohol that are so easily accessible. Lee almost gave into them, but a woman named Helene Moore saved him. Lee Morgan could have gone on to produce many more jazz records. Unfortunately, his bourgeoning career would be tragically cut short. In 1972, after getting into an argument, Morgan was shot by his wife in the middle of a show. Ironically, that woman who saved him would ultimately cause his demise. Born on July 10, 1938, in Philadelphia, Lee Morgan grew up loving jazz. He was the youngest of four children to Otto Ricardo and Nettie Beatrice, and the family moved to New York City after he was born. Morgan was interested in many jazz instruments including the vibraphone, the alto saxophone, and the trumpet. But he took a particular liking to the trumpet and when he turned 13 or 14, he was given one as a gift from his sister. After taking lessons with influential jazz musicians, such as Clifford Benjamin Brown, his style and talent developed rapidly. 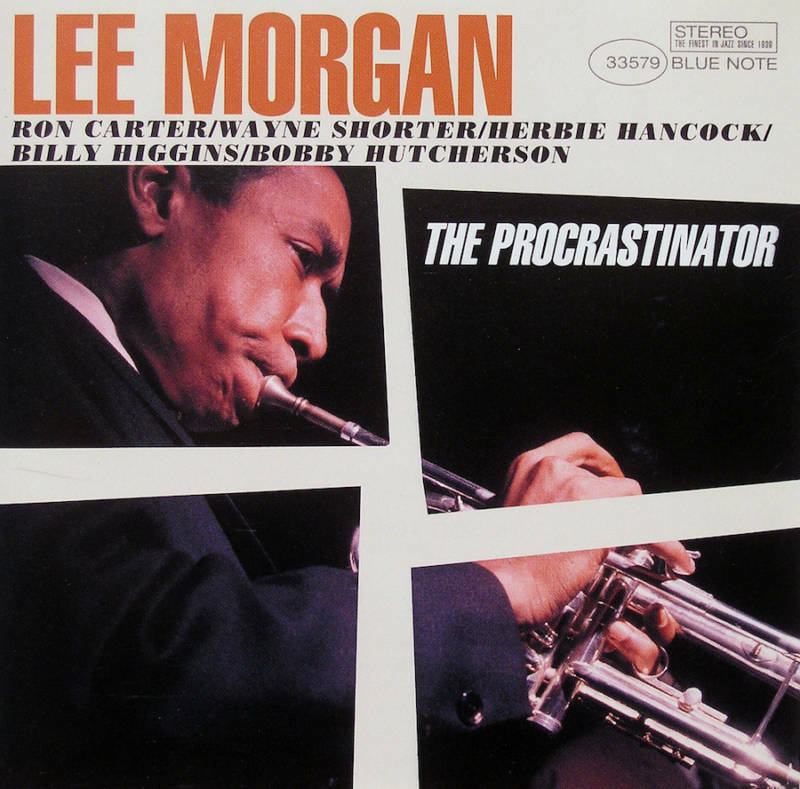 Album cover of Lee Morgan for the Blue Note record label. By age 15, Morgan was already performing at clubs on the weekends. He soon moved on to record with well-known bands, joining Dizzy Gillespie’s Big Band when he was just 18 years old. In 1957, Morgan recorded on John Coltrane’s Blue Train, which elevated him to a level of prominence in the jazz world, a level he remained at until his death. He wound up recording on 25 albums for the Blue Note, a notable jazz record label. After playing with other bands, like Art Blakey’s Jazz Messengers, Morgan tried his hand as a solo trumpeter and composer. 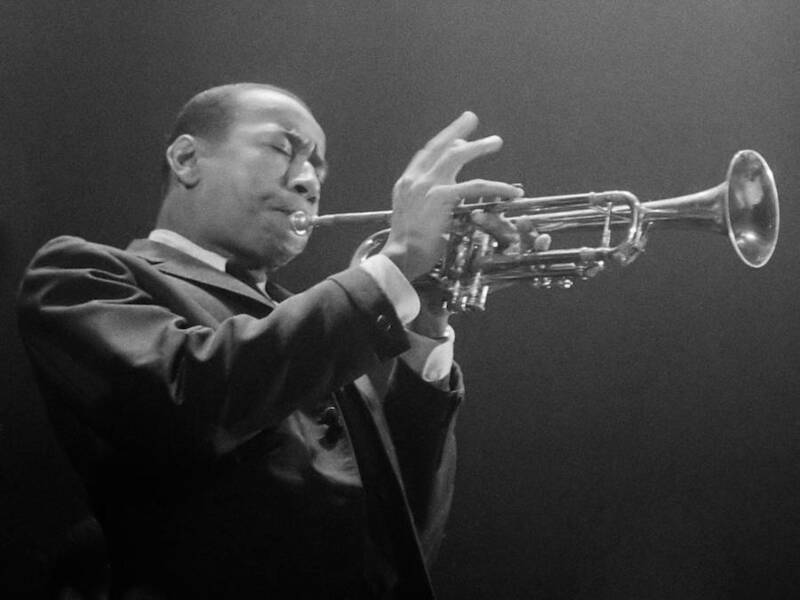 Lee Morgan’s lifestyle came with a side of adventure and risk. The jazz scene was loud, fast, and wild. It revolved around the night, which is when the music would come alive. It’s also when Morgan and his fellow musicians would race their cars down the city streets, drink strong cognac cocktails, and engage in many sexual escapades. 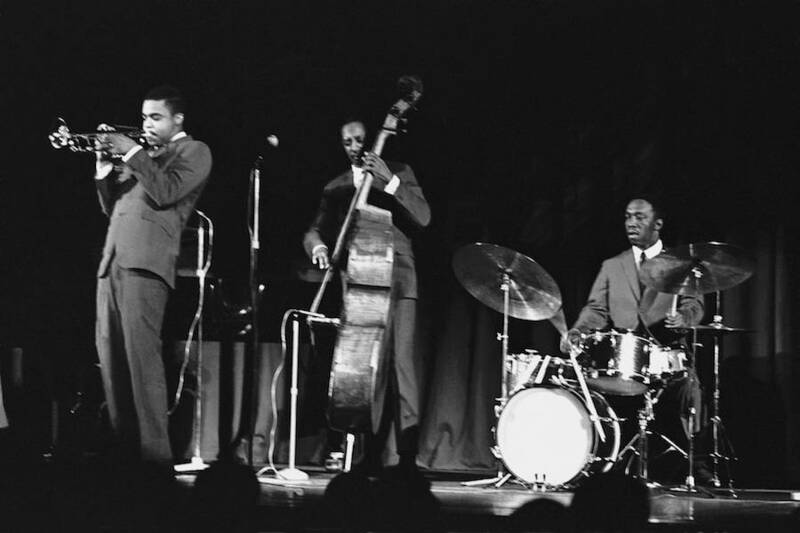 Lee Morgan (left) playing in Art Blakey’ s band with Jymie Merritt and Art Blakey. 1960. Drugs were a big part of the scene as well. Blakey introduced Morgan to heroin in the early 1960s and he soon became addicted. The habit had a noticeable effect on his playing as not only did he not sound as good, but he became flakey. One time while he was high, Morgan started dozing off near a radiator. He wound up burning the side of his head, leaving him with a scar and a bald spot for the rest of his life. Morgan’s heroin addiction lasted for years and reached the point where he’d say he’d rather do drugs than play music. Then, in 1967, after hardly playing anymore and having pawned his trumpet, Lee Morgan met Helen Moore. Moore was popular in jazz circles and was given the nickname “the little hip square.” Known as “Helen’s Place,” her apartment served as a refuge for all the musicians after the clubs closed down. It was also where struggling musicians and addicts would go to get fed and keep warm. So on a cold night in 1967, Lee Morgan came stumbling in. In the biography, The Lady Who Shot Lee Morgan , he’s described as “raggedy and pitiful” when he came in. But for some reason, Moore said, “my heart just went out to him.” She made him her project. “She was a sucker for people who were suckers,” said the author of The Lady Who Shot Lee Morgan , Larry Reni Thomas. Moore got Morgan’s trumpet back for him and helped him get clean. Though they were never legally married, Moore became his common-law wife and took his name. She got his career back on track too, booking him gigs as he worked to grow into the great musician he was capable of being. When he started playing again, the shows were some of his most daring and experimental. He became a must-see at clubs around New York City. It would seem like a happy ending. Except that Lee Morgan began seeing another woman, Judith Johnson. On Feb. 19, 1972, on a cold, snowy Tuesday night, Lee Morgan was playing a show at the popular jazz club called Slugs’ Saloon in the East Village of Manhattan. Though the specific details of the night haven’t been definitively confirmed, it’s alleged that Johnson was there that night, watching Morgan perform. Unfortunately, so was Helen. Feeling betrayed after everything she had done for him, the two got into an argument between sets. She left the club and came back with a gun. In a jealous rage, while Morgan was on stage during the second act, she shot him in the chest. Due to the snow, the ambulance was slow to arrive and by the time they got there, the 33-year-old trumpet player had bled to death. The murder shocked the jazz community and all those close with the Morgans. Helen Morgan was arrested and released on parole after serving just a short time. She moved back to her hometown of Wilmington, N.C. in 1978 and died in 1996 following heart problems. As for Lee Morgan, he led a short life that was filled with drama and struggle. But it was also filled with music that would influence generations of jazz artists to come. Even today, he’s considered one of the greatest trumpet players of the 20th century.